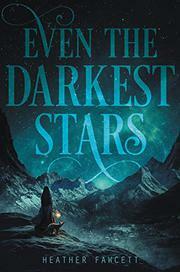 Debut author Fawcett offers an Everest-inspired fantasy. Kamzin’s world boasts magic in the form of inhuman witches, defeated some 200 years ago, and small dragons domesticated for the illumination cast by their glowing bellies. Shamans routinely cast spells; some fortunate souls, like Kamzin and her perfect older sister, Lusha, have familiars. River Shara, the young Royal Explorer, has come looking for a guide to climb the never-before-scaled Raksha in search of a magical talisman, and he ignores Lusha’s charms for often overlooked Kamzin, whose climbing ability and endurance are almost magical. The novel follows the often harrowing journey to Raksha; Fawcett’s descriptive skills bring the icy terrain to life and make what could be an endless trek largely compelling reading. She also ably combines magic with details borrowed from Nepalese life and language; characters wear chubas (Nepalese coats) and fight fiangul (fictional monsters). While the characters clearly live in an Asian-inspired world and seem to be Asian (physical descriptions are limited), this is a thin layer over the more developed fantasy elements and strongly evoked landscape.